Dr. Stan and Doris Bohon of Kirksville have established an endowed fund designed to assist students who participate in Truman’s renowned study abroad program. The inaugural award of $500 will be presented to a student for the spring 2008 semester. The fund was established by the longtime Kirksville residents in honor of their association with the University and to provide greater access to study abroad opportunities for students. Current students who have a cumulative grade point average of 3.0 or higher, are natives of one of the original 25 counties of the Northeast region of normal schools, and have a record of service in civic, church and school activities will be considered for the award. Doris Bohon is a 1943 graduate of Truman and served two terms on the Foundation Board of Directors. 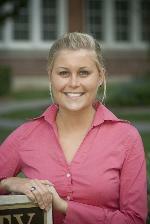 She is also a recipient of Truman’s Distinguished Alumni Service Award. Stan Bohon operated a dental practice in Kirksville for many years. The Bohons are retired and spend the winters in Fort Myers, Fla. The gift is part of Truman State University’s first-ever comprehensive campaign titled “Bright Minds, Bright Futures” with a goal of $30 million to generate private support for student scholarships, student enrichment initiatives, faculty development and enhancements to the athletic program. Plans are moving forward to establish the Ruth Warner Towne Museum and Visitors Center at Truman State University. The St. Louis-based architectural firm of HKW has completed a schematic design study to convert the former Kirksville Fire Station into a museum and visitors center. The plan has been approved by Truman’s Board of Governors and is now in the final design stages. The project will be let for bids late in fall 2007, with construction to follow. An estimated grand opening will follow at a date to be determined. In addition, Focus Communications has been retained to assist the University with the design and development of the museum’s content. The firm has extensive experience in working with museums in the Midwest. The 8,600 square foot multi-purpose facility will house the Ruth Warner Towne Museum and the University Office of Admissions. The building provides for offices and meeting space and functions as a welcoming environment to greet prospective students to the campus. The joint Museum-Admissions combination takes advantage of the Museum as a place for students and parents to become acquainted with Truman State University and its rich heritage. Additionally, the Museum will be available to the general public and any visitor to campus to view the exhibits. The Museum will also host select University receptions and gatherings. Approximately 4,000 square feet will be devoted to the Museum which will feature multi-media and electronic exhibits that are changing, dynamic and interactive. The space will also serve as an educational resource and learning environment for Truman students and professors, as well as regional school-age children. The Museum will also offer the University an opportunity to consolidate its museums system and collections, including the EM Violette Museum, as well as the development of an overall museums strategic plan. The facility will be financed through a combination of private gifts and University funds. The naming gift was received through a one million dollar bequest from Dr. Ruth Towne in December 1999. A portion of Towne’s bequest was earmarked for construction, with the majority designated as endowment to provide a lasting resource for museum operations and improvements. At the time, Towne’s bequest was the largest gift ever received by the University. She retired from Truman in 1988 as professor emeritus of history and dean emeritus of graduate studies following a 36-year teaching career at the University. University President Barbara Dixon (left) gathers with the William O’Donnell Lee Advising Award recipients (second from left to right) Carolyn Cox, Liz Hopkins-Jorn and Jose Herrera. 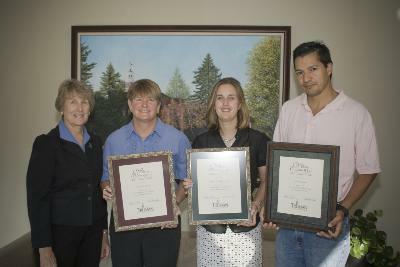 Carolyn Cox, associate professor of health; José Herrera, associate professor of biology; and Liz Hopkins-Jorn, instructor in health and exercise sciences; are the 2006-2007 William O’Donnell Lee Advising Award recipients. Dr. Jeanne Stephens Lee Blackmar established the Lee Advising Award in honor of her late husband who was a member and chair of the University’s Board of Regents during the 1970s. The award pays tribute to excellent advisers, encourages professional development and demonstrates the importance of academic advising on the Truman campus. Cox, Herrera and Hopkins-Jorn will each receive a $1,000 development fund to be used for travel to advising conferences or institutes, research materials and other relevant items. All full-time faculty advisers are eligible for the annual award. Recipients of the Lee Advising Award are nominated by students and colleagues and are ultimately selected by a committee. The Phi Beta Lambda National Leadership Conference took place in Chicago from June 23-26. Truman State University members and advisers participated. Several students were recognized at the Awards of Excellence Program. Amy Rowden, an economics major from Dixon, Mo., received first place in economics analysis and decision making. She also received third place for financial concepts. Lisa Hoffmann, a pre-business administration major from Jefferson City, Mo., received third place in parliamentary procedure team. Stella Costello, a pre-accounting major from Grayslake, Ill., received 10th place in hospitality management. Erin Lueker, a history major from Buffalo, Mo., received 10th place in impromptu speaking. Alicia Stewart, a history major from Clinton, Mo., was elected National North Central Region vice president for 2007-2008. Phi Beta Lambda is an educational association of postsecondary student members preparing for careers in business. There are more than 11,000 active members in the United States. Missouri has almost 600 members in 30 chapters. Truman’s United Way Campaign kicked off Aug. 24. All faculty and staff members received information about the campaign in their campus mailboxes. The United Way thanks everyone who has already contributed. If you have any questions, please contact Teri Heckert at theckert@truman.edu or Brad Chambers at bchambers@truman.edu. During the campaign, Heckert and Chambers will answer FAQs in the Truman Today. A: Heckert and her husband had the same question. They used to give directly to Victim Support Services (VSS). The United Way raises more money for VSS than VSS could raise on its own. As a result, when people give through the United Way, when they contribute to this fund-raising effort; they are part of the bigger picture. In addition, they love the convenience of payroll deduction, which is an option when giving through the United Way. The Public Relations Office has announced Sarah Shasserre, a senior public communication major, as intern for the fall semester. Shasserre is from St. Louis, and is a 2004 graduate of St. Joseph’s Academy. She is the daughter of Stephen and Karen Shasserre and the oldest of two children. As the intern, she will assist in the writing, producing and distributing of the University newsletter, Truman Today, as well as posting it online. She will also be responsible for editing the calender on campus Channel 36, writing press releases and performing various office tasks. At Truman, Shasserre is currently the vice president of public relations and recruitment of social sorority Alpha Sigma Alpha, and she previously served as the social chairman. She also previously served as the vice president of communication honors fraternity Lambda Pi Eta. She is currently a member of Greek honors fraternity Order of Omega and the Advertising and Public Relations Organization. Shasserre’s interest in written communication and obtaining experience in other various communication outlets led her to this position. MO-AG will award three $1,500 Dean Warnstaff Foundation Scholarships in January 2008. The scholarship recipients will be individuals who are currently attending a Missouri institution of higher education (no high school student application accepted) and majoring in a field related to agriculture. College freshman through college seniors are eligible to apply. The deadline is Oct. 3. Students must be enrolled in college for the 2007-2008 academic year, attending a Missouri college and majoring in a field of related to agriculture. Students must send a completed application, two letters of recommendation, and a complete transcript to apply for this scholarship. Applications can be sent to Missouri Agribusiness Association, Ginger Berry, Director of Communications, P.O. Box 1728, 410 Madison Street, Jefferson City, Mo., 65102. Download the application at http://trumantoday.truman.edu/DW2008scholarship.pdf. For more information, contact Berry at mo-ag@mo-ag.com or 573.636.6130. The Foundation of the National Student Nurses’ Association (FNSNA) is now providing applications for a scholarship. Undergraduates pursuing their first degree in nursing may easily obtain information or download an application by visiting http://www.nsna.org and clicking on Foundations/Scholarships. Awards range from $1,000 to $5,000 and applications must be received by Jan. 11. Winners will be notified in March 2008. For additional information, point your browser to http://step.truman.edu and go to the News, Upcoming Events and Deadlines page. This workshop is open to all interested faculty, staff and science, mathematics and computer science majors and minors. First year and transfer students are strongly encouraged to attend. The University Art Gallery at Truman State University will be presenting “25 Years of Printmaking,” a retrospective exhibition of work by Jim Jereb, professor of art and masterprinter. The show will be on display until Oct. 9. The Center for Student Involvement (CSI) will host the Activities Fair, which is intended for new and returning students. Contact the CSI at 785.4222 for more information. This is the first School of Business Majors Induction Ceremony, and it will be an annual event. The Student Union Office will be closed Sept. 7 to move the SUB Reservation Office, FAC Office, SERVE Center, and the SUB Director’s Office up to SUB Room 321, as renovation begins in the old spaces. They will not be able to take any reservation requests Sept. 7-9. They will open up in their new office on Sept. 10. The Food Service Office and the Sodexho Director’s office will also be moving to the SUB Spanish Room. Truman State University Kirksville Alumni Chapter invites students, faculty and staff to a Tailgate Party and Football Game under the new lights! Students will not be able to use their student ID for their meal plan or Bonus Bucks. “Deadwood” will provide live music. General admission tickets are $7 for adults and $5 for children under 12 and senior citizens. Admission is free to students with a Truman ID. R.S.V.P. requested by Sept. 5 to the Office of Advancement 785.4133 or alumnievents@truman.edu. Please specify the event. 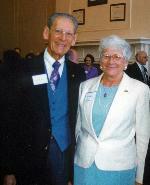 Contributions to the Kirksville Alumni Chapter Scholarship will be appreciated. People want to make changes in their health behaviors and just have a difficult time sticking with their good intentions. Are you one of these people? Time to sign up for the Fall 2007 TruFit Wellness program designed for faculty and staff members looking to make changes to their health. In addition, this fall semester participants will have a choice in participating in either or both a walking program or a group exercise class lead by Karen Skoch, director fitness/wellness at the Student Recreation Center. TruFit members will meet 12:30–1:30 p.m. on Wednesday afternoons. Activity options will include walking on Mondays from 12:30-1:30 p.m. and/or group exercise class on Fridays from noon-1 p.m. Meetings will begin Sept. 12 and continue through Dec. 7. Any Truman faculty or staff member who is not currently engaging in regular physical activity is encouraged to join. Make a change for yourself today and get for more information. Students who have good communication skills on and off the phone, an outgoing personality, a reliable and dependable work ethic, and a willingness to ask parents and alumni for financial support are needed. There are nightly incentives (prizes, food, etc.) as well as the institutional wage of $6.50 per hour. Contact Brad Neathery at 785.7432 or neathery@truman.edu or stop by the Office of Advancement, McClain Hall 100. The application deadline is Sept. 10. The Pickler Memorial Library Catalog was recently upgraded, improving its display features and searching capabilities. The new display streamlines search results, allowing users to view availability of materials at a glance. Other features include new ranking capabilities, spell check and more. Check it out today. Contact the Reference Desk at 785.4051 for more information. Beth Kroes is setting up a carpool network for people who live off campus and commute to Truman from Macon, LaPlata and Atlanta, Mo. Contact Kroes at blk926@truman.edu or 660.395.9731 if you are interested in getting involved with this carpool network. Classes will take place at the Public Safety Building. Class size is limited. Call 785.4177 to reserve a space within the class. Sarah Bloch, a senior biology major, presented her research with Barbara Kramer, associate professor of chemistry, at the International Conference on Environmental Science and Technology Aug. 7 in Houston, Texas. Her poster titled “Study of Safe Soil Amendments to Enhance Lead Phytoremediation” was selected for top honors from among posters given by faculty and graduate students from around the world. Bloch’s research was funded by Truman’s NSF Next-STEP program and the VPAA Alumni Stipend. Gregory Jones, professor of music, traveled to the Greek island of Corfu in July to teach in the 5th Ionian Academy of Music. Jones joined members of the Royal Concertgebow Orchestra, the Austrian Mnozil Brass, and internationally acclaimed trombone soloist Christian Lindberg in offering a series of brass masterclasses and performances for students and the public. This seminar attracted student participants from Europe, the Middle East, America, and Canada, among them, Truman sophomore trumpet major, Paul Hermanson. Joaquin Maldonado-Class, associate professor of Spanish, presented a paper titled “Rigoberta Menchu: entre la guerra civil y las guerras culturales” at the First International Congress “Desmarginalizacion de las tendencias literarias y linguisticas en America” celebrated at the Universidad Nacional Mayor de San Marcos (Unidad de Postgrado) Lima, Peru. Marc Rice, associate professor of musicology, presented a lecture titled “Ethnomusicology and Fieldwork in Louisiana” at the Universidade Federal da Bahia in Salvador, Brazil in June. Faculty/staff football tickets can be purchased online at http://gobulldogs.truman.edu. Prices are $30 for a reserved season ticket. Faculty and staff can still receive two free general admission tickets on the day of the game at the ticket window, each additional general admission ticket is $5 each. Registration for women’s sorority recruitment will continue from 11 a.m.-3 p.m. Sept. 4-5 in the Student Union Building, Centennial Hall, Ryle Hall and Violette Hall. Women’s sorority recruitment will take place Sept. 6-10. IT Services invites faculty, staff and students to TechBreak at 1:30 p.m. each Friday in the Student Union Building Room 320. This weekly series is an opportunity to share information about new and existing IT Service offerings. Please join them for snacks and conversation. Log on to http://its.truman.edu/techbreak for additional details. The first Weekly Lunch Series for the fall semester will be from 12:30-1:30 p.m. Sept. 5 in the Student Union Building Alumni Room. This session will be about cooperative learning. Al Weitz presents "What I Learned About Cooperative Learning at the Lilly Conference." Contact The Center for Teaching and Learning at 785.4391 or ctl@truman.edu for more information. The first Physics Colloquium of the year will take place at 4:30 p.m. Sept. 5 in Magruder Hall 1098. Refreshments will be provided at 4:20 p.m. Eric Dieckman, Cody Sumter and Adam Vogt will be presenting their research. Students will be able to learn how to repair their bike from noon-4 p.m. Sept. 6 on the Quadrangle during the Activities Fair. The Bike CO-OP will have a table at the Activities Fair that will be offering repairs for bikes and answering bike questions. They will have a variety of tubes available ($3 per tube) to help students change a flat, lube for their rust chain, and some tools for basic adjustments. Donations are encouraged. Contact Cassie Phillips at cassiephillips@care2.com. The University Club will sponsor a Welcome Picnic at the Club’s house, 516 E. Patterson St., beginning at 5 p.m. Sept. 7. Barbecue from Westerns will be provided by the Center for Teaching and Learning; please bring a dish to share. The faculty/staff group, Red Wing, will perform traditional and folk music. All Truman faculty, staff and families are invited. New faculty will be the special guests. High Street Dancer clinics and tryouts will take place from 6:30-8:30 p.m. the first three days and 9 a.m. the last day in the Pershing Building rooms 130, 120, 225, and then again in 130 on Sept. 11, 13, 14, and 15. The price for tryout will be $3. Contact Melody Jennings at 785.7259 or jennings@truman.edu for more information. The Student Recreation Center will be celebrating its 10 year birthday by running a display of former staff pictures, wacky facts about the center, and construction scrapbooks from Sept. 10-12 inside the Student Recreation Center. The Rec Center will be hosting a carnival from 3-5 p.m. Sept. 12. Games, prizes, cake and punch will be provided. The celebration will come to an end with a grand prize paper airplane toss in the main gym from 4:30-5 p.m.
Women’s Club Soccer tryouts will be from 5:30-6:30 p.m. Sept. 11 and from 4-5 p.m. Sept. 12 at the intramural field behind Centennial Hall. Contact Jessica at jlufkin@gmail.com for more information. 1. Indicate the student role for which you are applying. 3. List name and contact information for two references who can comment on the quality of your work in role for which you are applying. To be considered for the position, you will need to have your application to Gilchrist by Sept. 21. If you have questions please feel free to contact Student Affairs at 785.4111 or lcg@truman.edu. Student Affairs also has a Web site that students can go to at http://saffairs.truman.edu/apply.asp. The Truman community is invited to attend the 15th annual McNair Research Presentations from 9 a.m.-4 p.m. Sept. 26 in Violette Hall 1000. The McNair scholars will be presenting the results of their summer research projects. A number of different fields will be represented including English, biology, health, theater, political science, business, psychology, communication, sociology, economics and history.